This week’s WordPress Weekly Photo Challenge is Serenity. This is the swan I photographed earlier this fall who was so relaxed in my presence that it took a nap while I was hanging out at its pond. A perfect candidate for this week’s theme! This image was edited in Lightroom and Macphun’s Tonality Pro. ← Ring-Billed Gulls of D.C. 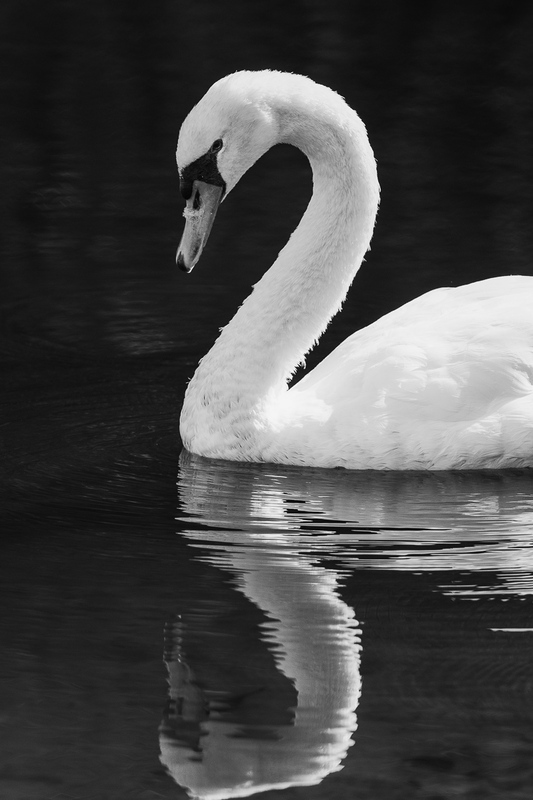 I do love the curve of a swan’s neck. I’m not sure why that brings me peace, but it does! Thanks, Ruth! 🙂 Apparently you’re not very threatening Tricia! Lovely capture. LOL! Yes, I guess that’s true! The black and white works well with this bird. I’ve taken lots of swan photos and been disappointed with many of them because the white is so difficult to capture in the winter here, with a mostly white background. This seems like a good solution. The white on this swan was rather dirty, especially down on the water line. I thought black and white would hide that grunge. I tried to process it in color, because the background was pretty, but it didn’t work. I can see how the white on white would be tough, too. Swans are a challenge!